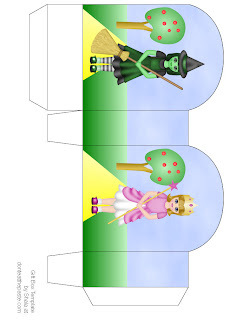 I'm thinking about making a door sign that can be turned out that says "The Witch Is" at the top with a wire hanger and the two witches on this box on either side of a card on a string that can be turned with "Wicked" under one, and "Nice" under the other. Anyway, I couldn't resist recoloring the witch again and doing this pair of cuties. I hope you like the box! Print at 100 DPI. Click on the image for the full sized version. That's super cute, I'll be linking. If I had a sign like that I doubt I'd ever turn it around. =) Being the bad witch is so much fun.